Here it is completed. A great design by Blomqvist and Persson that is tatted in one pass. I'm such a fan of one pass designs! Very clever. 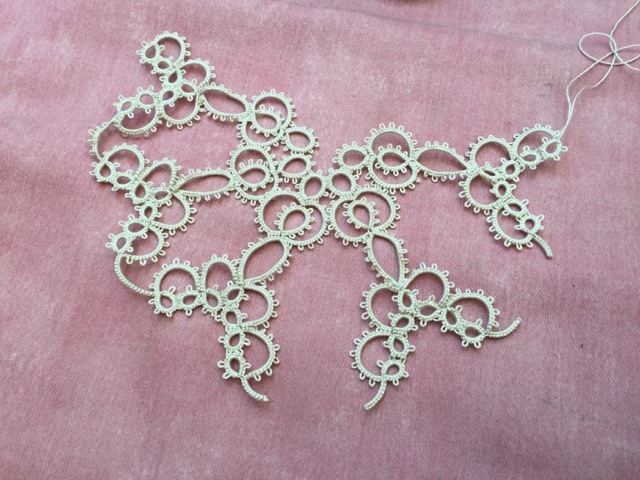 The chains that link the centre medallion to the outer diamond shapes have to be straighter than their natural curve which means there is some tension there and those chains do not lie perfectly but apart from that I'm pretty happy with it. 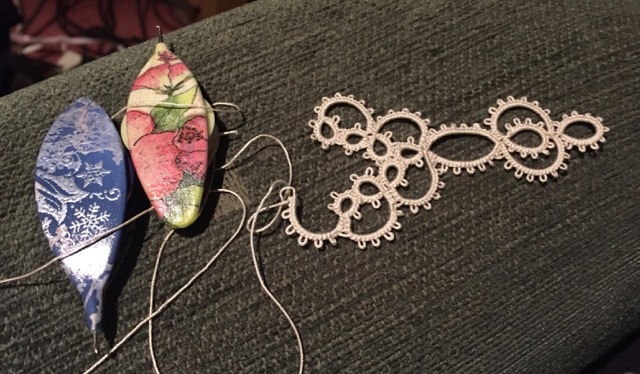 If I was making it again, I might try to tat the bottom joining chain between repeats the other way (as in the pattern) instead of reversed as I chose to make them. I still think it needs a bit of adjustment in that area and it would be worth remaking. 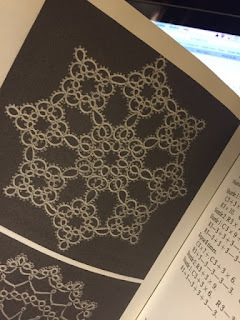 Robin was right: I was not reading the pattern properly. That's because it's written in a rather unusual way; instead of numbering picots, it numbers segments between picots so I was making one too many picots (and extras stitches) in several places! In the end I actually stopped reading the written pattern and just referred to the photo for the right number of picots and where to join them. 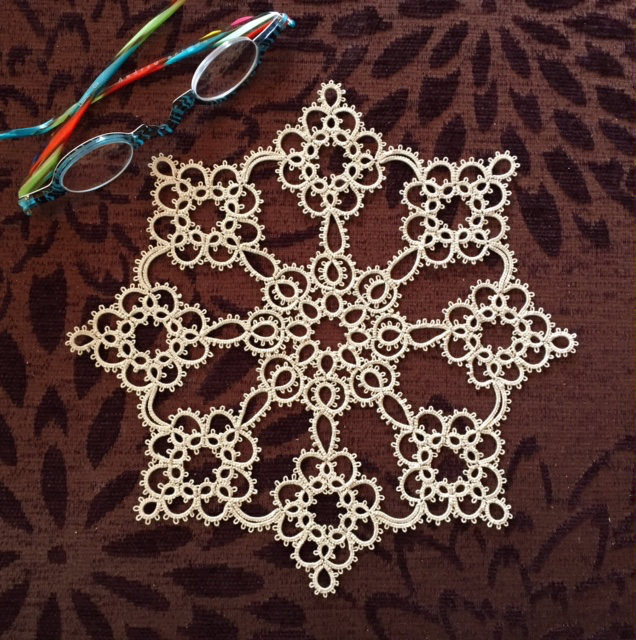 I still kept my chain reversed the other way between repeats and I added just a few more stitches to it to give a bit more space between repeats. I think it will work out this time. 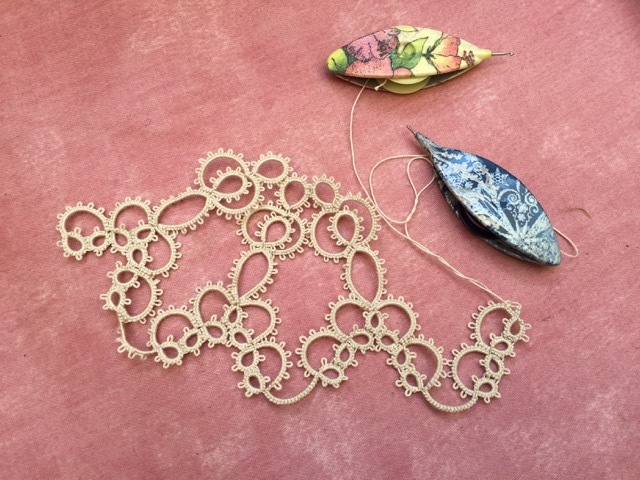 It's now lying flat and the shape is good and it looks like the eight repeats will fit just right. I look forward to starting on the second round and I do love the fact that it will be continuous! You ladies are wonderful!! Your comments on the previous post were really helpful. Of course, as soon as you explained it made sense. BUT... and it's a big but, though the pattern now makes sense, I'm finding it's not fitting properly. 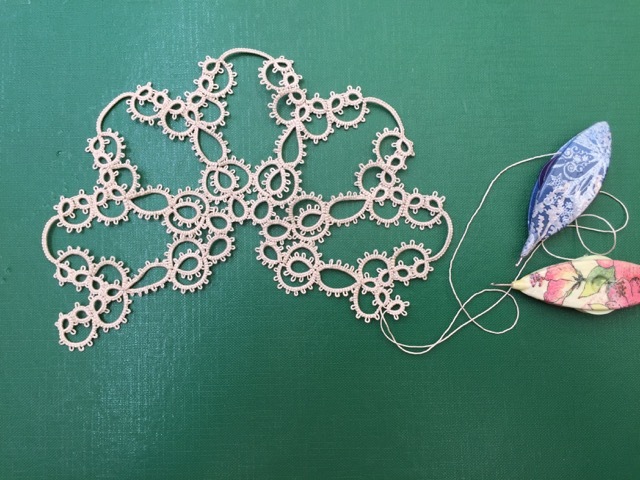 I reversed the linking chain (between repeats) because I found there was a lot of tension on that chain which was distorting it (and you can see that on some of the ice crystal doilies I've looked at on internet) as well as on the photo that accompanies the pattern. But I'm finding that there is not enough space between repeats which means that after four repeats, I still do not have a semi-circle and therefore I won't be able to close the circle when I reach 8 repeats. I don't know where I'm going wrong! It doesn't look too bad on the photo below after 5 repeats but it's not lying flat at all! It's "cupping" badly. And see where the linking chain is? Imagine that chain curving the other way, it would end up being on top of or under the two chains either side. I ended up cutting the connecting chains to see how it would naturally lie and this is the gap between repeats that I'm getting. What should I do? 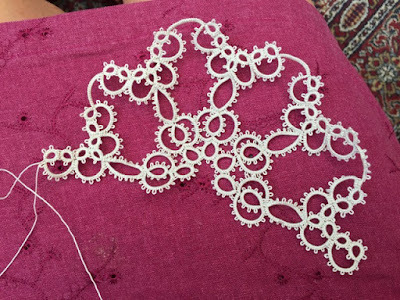 It must be me since I've seen many of those doilies and they seem to fit fine after 8 repeats. Am I missing something? 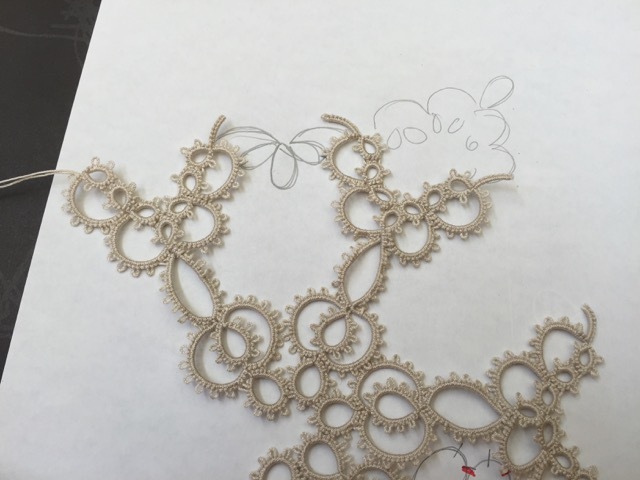 Looks to me like I'd have space for an extra design element between the repeats.... but that can't be right. The other thing I have found is that there are lots of discrepancies between the photo and the written pattern. 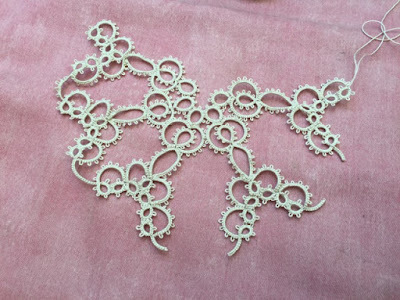 Many joins are not indicated on the pattern although they appear to be made on the photo and in the pattern, some rings have 6 picots and others have 5 although on the photo, all rings seem to have 5 picots. Same problem with the chains! I have tried to look up the thread about this doily on Craftree that someone mentioned but have not located it so far. Still... I won't be defeated! 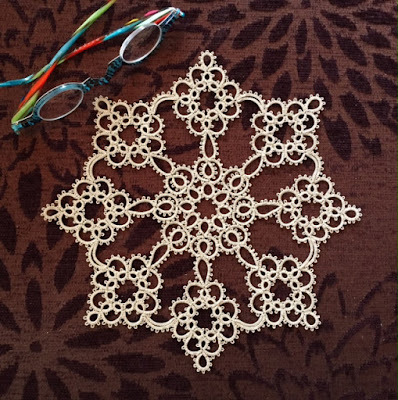 Many people have successfully tatted this doily. Surely I can do it too! Hi all! 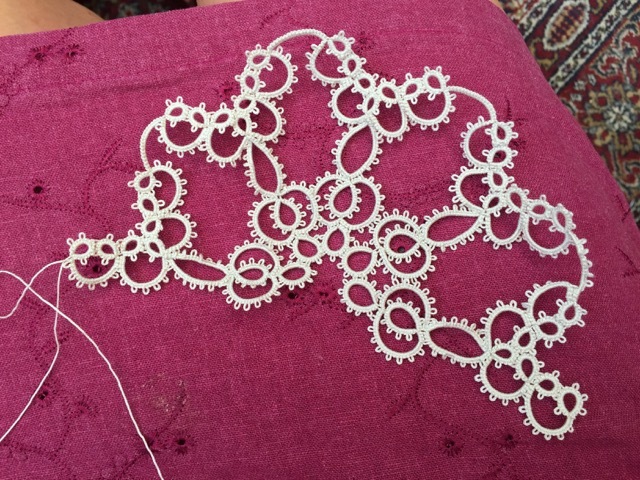 Not doing too well on the tatting front at the moment... I've tried a few different things but nothing's working out too well. I decided to make a blogpost anyway, in spite of not having much to show you, since it's been so long already since I last blogged. Anybody else has made this pattern by any chance? I was hoping the whole thing was worked in one pass but now I don't think it's possible and I can't even figure out how to complete this first repeat! I will leave it for tonight and look at it afresh in the morning. I hope I can figure it out because I rather like the look of this design. How is everyone doing? Last day of school for our youngest today so summer holidays really start now. I hope the sun is shining where you are!